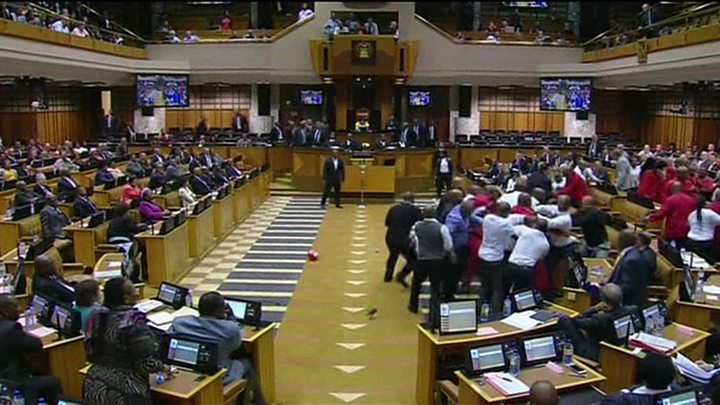 A brawl broke out in the South African parliament on Tuesday as security officers were ordered to forcibly remove opposition MPs. Several punches were thrown as the left-wing Economic Freedom Fighters (EFF) were expelled after trying to stop President Jacob Zuma speaking. In March a court ruled Mr Zuma violated the constitution by failing to pay back public money used on his mansion. Guards surrounded the EFF MPs who were dressed in their trademark red boiler suits. Objects, including bottles of water and a hard hat, were thrown as the guards tried to wrestle the MPs out of the chamber. The EFF has denounced Mr Zuma as an "illegitimate" ruler who should step down. South Africa's highest court, the Constitutional Court, ruled that Mr Zuma had violated the constitution when he failed to repay government money used to upgrade his private home in the rural area of Nkandla. In a second case, at the end of April, a court said that Mr Zuma should be charged with corruption. Mr Zuma denies any wrongdoing, and says he will continue to "shepherd" the nation. His term is due to end in 2019. In his first appearance after this court ruling at the beginning of May, a brawl also broke out as EFF members were evicted for heckling.